I have a small collection of pitchers that I wanted to show you. It all started with a pitcher that was originally my grandmother’s. 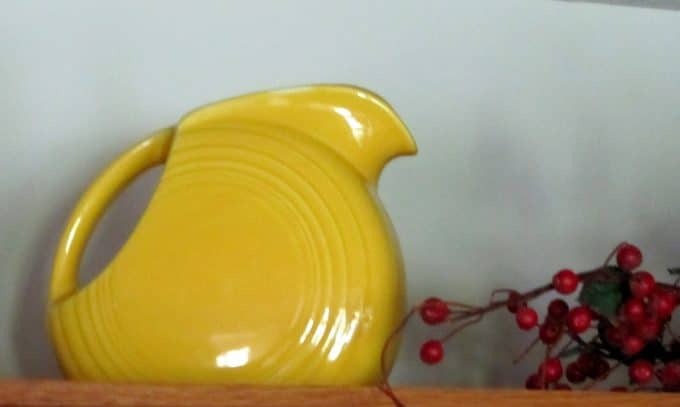 It is a Fiestaware disk juice pitcher in Harlequin Yellow. 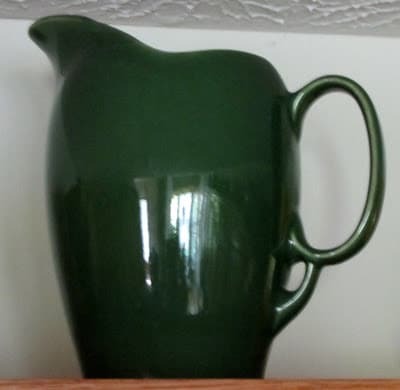 This pitcher was a gift from my sister who found it at an antique store. 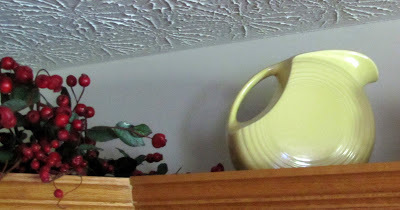 It is a Fiestaware disk water pitcher in a lighter yellow color than the first one. This water pitcher is about 7 1/4 inches tall, whereas the juice pitchers are about 6 inches tall. I think this yellow is the original yellow that Homer Laughlin produced. 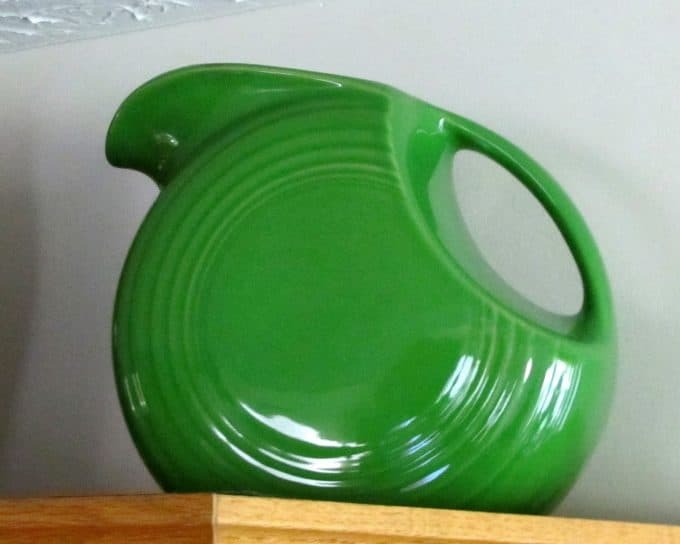 These two pitchers are vintage Fiestaware. One major way to tell whether it is vintage or not is that after 1986 they started putting a raised H on the bottom of the pieces, prior to 1986 there was no H on the bottoms. 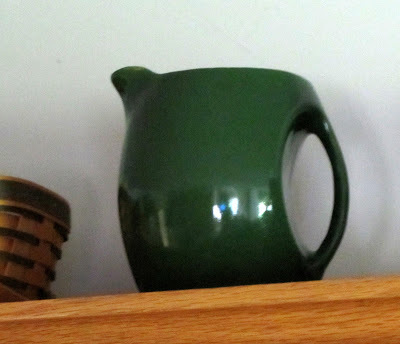 This green Fiestaware disk water pitcher is a new pitcher that was flawed. I bought it at a local shop that has some 2nds in Fiestaware. The color is Shamrock Green and is quite bright. 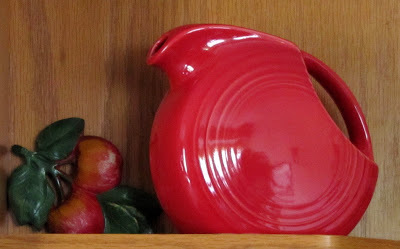 This gorgeous red Fiestaware disk juice pitcher was another gift from my sister. I believe the color is called Scarlet. 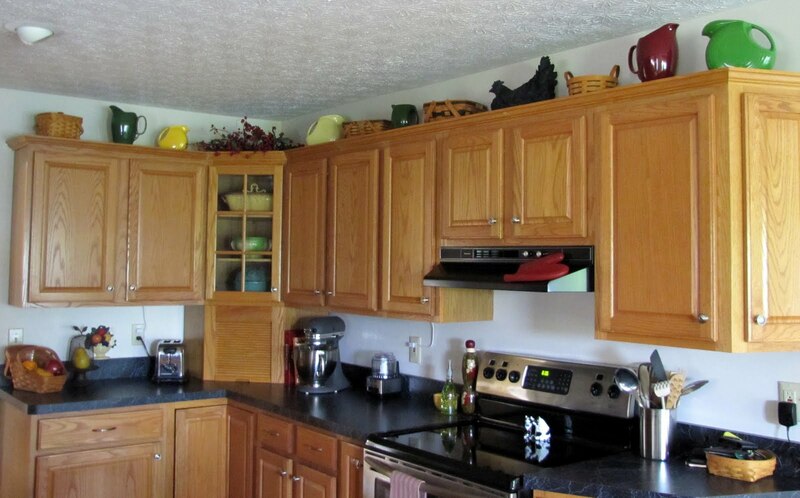 There are many different Fiestaware items available. Dan at Yesterday Once More has an awesome collection of Fiestaware if your are interested in seeing more colors and items. I’m sure you would enjoy his blog if you don’t visit there already – he has a lovely home and three very cute Miniature Schnauzers! I am afraid to start collecting more than just the pitchers, because I think it could be addictive! and the identical pitcher in Burgundy. 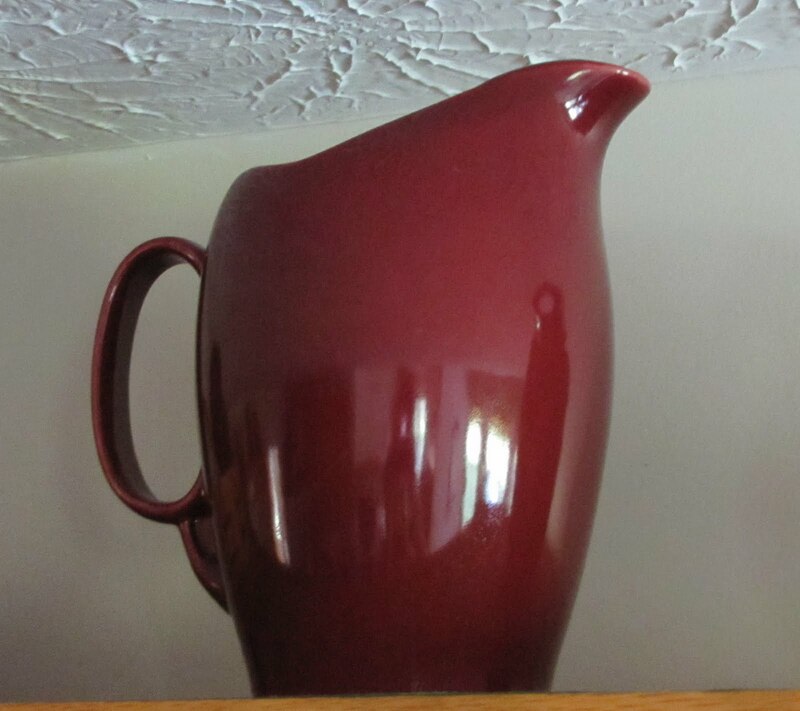 This is also unmarked and looks to be either a large creamer pitcher or a juice pitcher. And this is where they all reside. On top of my kitchen cabinets along with some Longaberger baskets and a chicken. The chicken was bought on a whim at Hobby Lobby and since I didn’t really have a good place to put him, I thought he’d like to oversee the basket and pitcher display (my counter tops are black so he just blends right in if I put him down there). 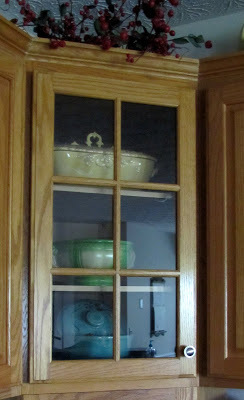 In the glass doored cabinet I have a few vintage items. I change this area out a lot, but I think it looks best with larger items in it rather than a bunch of glassware or china. 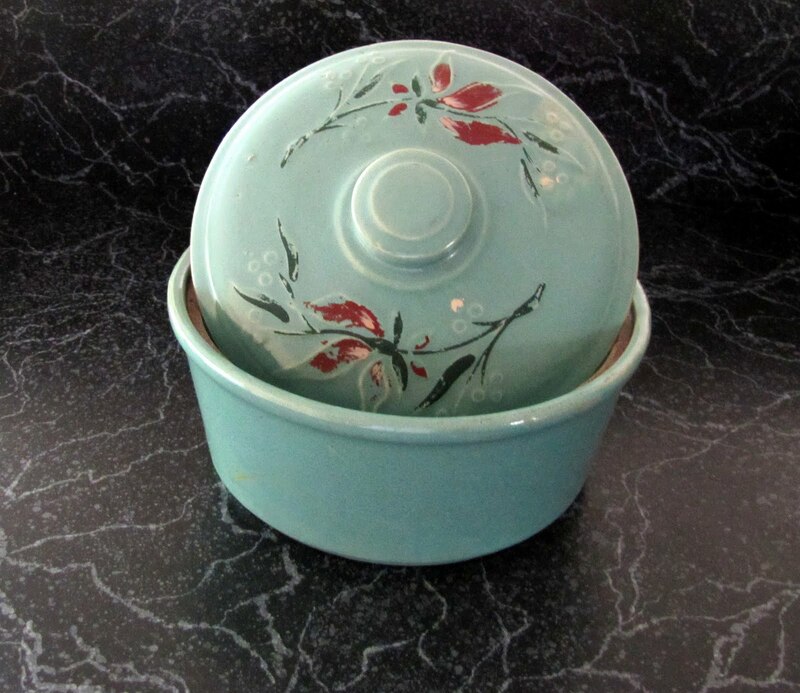 This is a casserole dish that I bought at a local craft store a few years ago. It is not vintage, but I love the soft yellow color and details on the handles and lid. 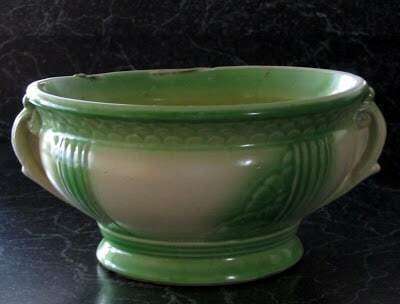 I have no idea what this green bowl is supposed to be. The woman I bought it from thought it was a bulb bowl (like in tulip bulbs I guess). 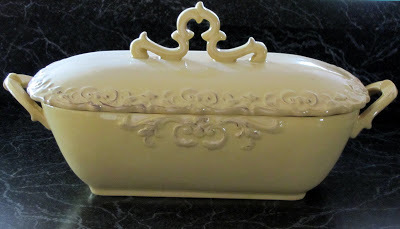 I think it may have been a soup tureen that is missing the lid??? It may be McCoy since it has the USA mark on the bottom, but since there were other companies that used that mark also, it’s hard to tell. I love the cream and green color combination though. It was love at first site on my part. The last item in the cupboard is a blue bowl with flowers on the lid. I found this deep in the recesses of my mother’s basement one day and brought it home to my house. It was absolutely filthy and I’m afraid I may have over-cleaned it because there seems to be paint missing from the berries on the lid. It is marked Monmouth, USA on the bottom which is a company that produced pottery in Illinois. I’ve never found a piece exactly like it on ebay or other auction sites, so I’m not sure of it’s age, but I would guess pre-1950’s. I hope you enjoyed the tour of the pitchers. 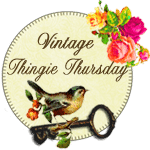 I am participating in the Colorado Lady’s Vintage Thingies Thursday party. 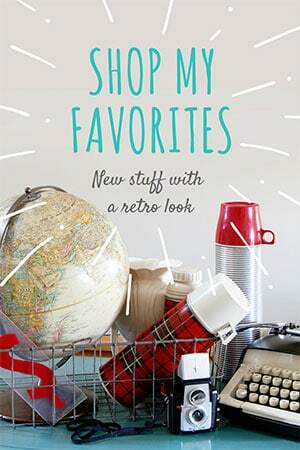 Check out the other vintage items by going to her blog. Your pitchers are wonderful and your manner of display is the right choice–especially the chicken. Thanks for the info on the ‘H’. I love the pitchers! You are right, it can be very addictive. All of your other pieces are wonderful too! I have never seen so many different and colorful pitchers. They do make for a nice collection, but I would not have the space for them. You have done very well with yours. I also participate in Pink Saturday with Beverly at How Sweet The Sound. She likes us to share someone we have not visited before. 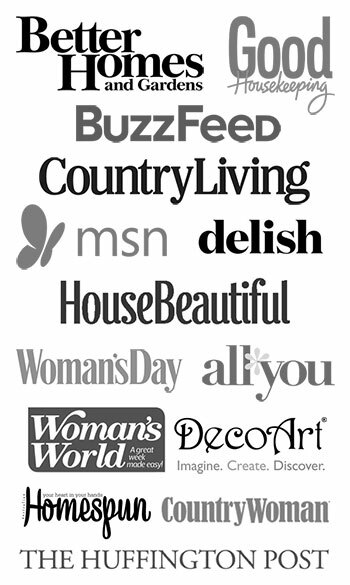 I would like to feature your blog this coming Saturday. I really enjoyed it and am sure others will too. Beautiful Fiestaware – you have a wonderful collection of pitchers. The pitchers are lovely and look so nice on top of your cupboards- my cupboards go straight up to the ceiling so I have no room for pretty displays. My favorite today is your adorable blue bowl with the berries on the lid, I think the chippy paint only adds to its charm. Happy VTT! What a wonderful pitcher collection and I love how you have displayed them! You have a lovely collection! The Fiestaware is just so…festive! Great collection, I learn so much every Thursday! I absolutely love that last piece you shared. Happy 4th! Talk about pitcher and casserole dish heaven!!! 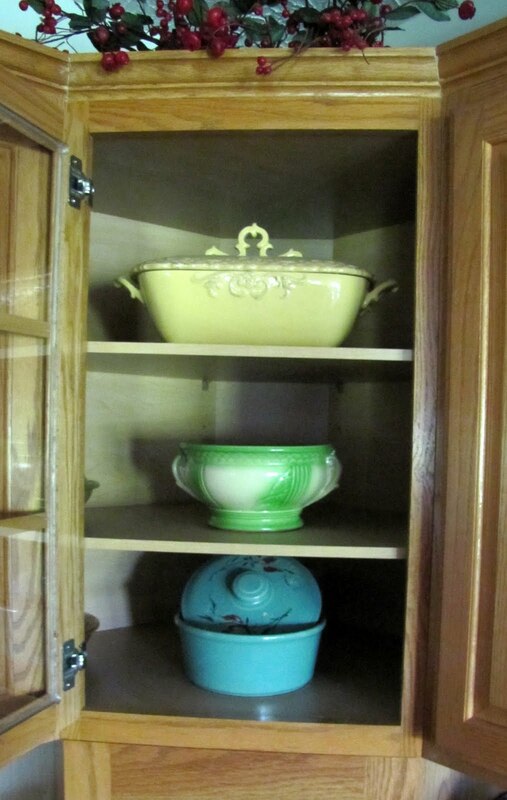 I love that yellow one, and the little light green casserole with the lid!! Lovely!! Have a wonderful VTT!